Ann dreams of a marriage proposal from her poetic suitor-until she meets a runaway apprentice who knows what a truly noble man is. In 1826, Ann Miller travels to Pittsburgh with her widowed father and two young sisters, only to find that a mysterious man has pursued them all the way from Ohio. Is Ann's father just a circuit minister, or is he hiding something that may endanger them all? Will Hanby indentures with a Pittsburgh saddler maker, only to discover that his master is a cold-hearted tyrant. After years of abuse, Will becomes a prisoner of his own mind. But then lovely Ann Miller comes to stay next door and her compassion lights a long-dark part of Will's soul. His renewed courage puts his life in jeopardy as he begins to assist fugitive slaves. Will's murderous master and Ann's questions about her family may keep both of them bound in the shadows forever. Or will they find freedom-together? Rosslyn Elliot is a debut author with this novel about a saddler and his family in 1826. I have to say, I thought this was a well paced and action packed book. I couldn't put it down! I loved reading about the Pittsburgh area (being a PA girl) and really got into reading about a saddler and his family. I loved the sub-plots that dealt with Ann's father and the questionable choices that he makes (in society's view). I also loved that Ann made mistakes, but wasn't incredibly selfish (like other girls in historical fiction can be portrayed). I loved Will Hanby- a broken soul with little hope in his life. He was the real character I wanted to follow in the book. I loved how we were given a look into his narration of the story as well. I do have one problem with this book. It has nothing to do with the author, or the story itself. It is the cover. The cover of this book drives me NUTS! I feel like it is a very bad photoshopping job. It makes me sad because I know people will pass over this book because the cover is so odd looking- I am telling you... don't. Even if you have to rip the cover off - read this book. It is such a great read, you won't regret it! Club Chat Party on Facebook! Sigh...romantic. written historical series debut…". Read more reviews here. Party. Details and official rules can be found when entering the contest. certificate toward a FABULOUS custom-made period dress from Recollections! 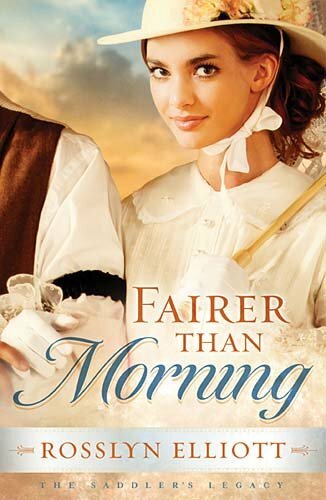 Coranne, thank you so much for taking the time to read and review Fairer than Morning! I am so glad you liked it, and touched by your comments. I also think your name is beautiful--I haven't heard it before.